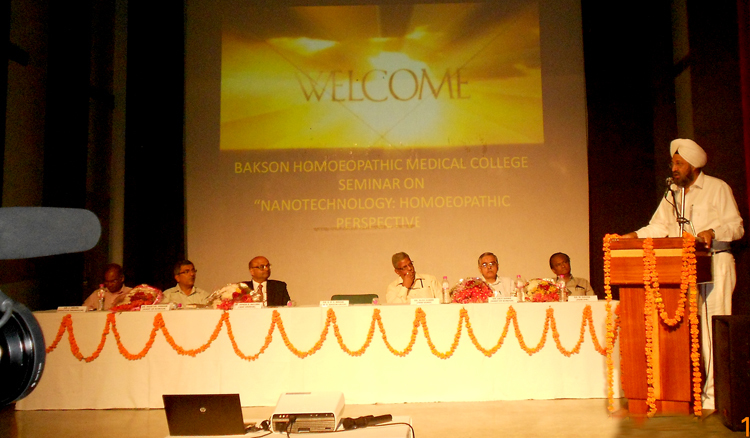 GREATER NOIDA.NOV.2011: Bakson Homoeopathic Medical College,Greater Noida organized a seminar titled, “Nanotechnology: Homoeopathic Perspective” at YMCA, Greater Noida. Prof. Jayesh Bellare, a reputed scientist from IIT, Bombay who made the revolutionary discovery proving the scientificity of the action of homoeopathic medicines, presented his research titled, “Extreme Homoeopathic Dilutions retain starting materials-a nano particulate perspective”. Dr Alok Kumar, Director General, Central Council for Research in Homoeopathy was the chief Guest. Dr. Rajiv Kumar Sharma, Director of Pharmocoepia Laboratory of Indian Medicine and Homoeopathic Phamacoepia Laboratory and Dr. Lalit Verma, Secretary of Central Council of Homoeopathy was guests of honour. Dr. S. P. S Bakshi, CMD of Bakson Drugs and Pharmaceutical Ltd preside over the function. Dr. C. Nayak, former Director, CCRH welcomed the guests and Dr.M.Ghosh, Principal of the College proposed vote of thanks. Dr.Mukesh Gautam,Dr.Kathika,Dr.Ashwini, Dr.Somnath,Dr.Rajender,Dr. Somesh etc coordinated this program.